She has the original Amal on at present. By the time I’ve replaced the slide, jets, etc, etc I’m half way to the cost of an Oko or similar. Someone since 2016 must have had this issue, researched the far end of all options and changed the carb or just re built the Amal. All thought and opinion gratefully received, but no negative comments on the 348 please, I know it’s limitations with weight, turning circle, headstock frame weakness etc,etc.But I had so much fun riding one all those years ago. Also it only selects 1st and 2nd at present, after the previous owner did some home maintenance. He didn’t split the cases so I assume it’s just a case of getting the selector set up right. I know there are a few posts on this subject. If memory serves, your selection problem is caused by the drum in which the pawls slide having been put in upside down. The groove for the pawls is offset from centre. Because they aren't popular j u st now, doesn't reflect on their performance. They were certainly good for flying over the moors Ross and the early ones very fast (in context) on the road. Now that I think about it I remember scraping my wellie boot whilst cornering on the road at the Alan Trophy. I must have been braver then as the footrests were pretty high, in accord with the Rathmell design. To answer your carby question, I've had a 26mm OKO on my 348 for a couple of years now and it works very well. Prior to that I had a VM26 Mikuni on it which was also good. Do you know what jets your using, also do you need to alter the inlet rubber or air box rubber? I've gone the same route as Feetupfun, from the original Amal, to a VM26 Mikuni, to a 26 MM OKO. Could never get the Mikuni set up to where i liked it. The OKO works great with a 50 pilot jet, needle in top notch, and 115 main. Actually there is nothing wrong with the Amal if it wasn't for the fact that they tend to wear, especially around the slide. Mid Atlantic Trials sell an OKO on eBay which is jetted ready for the 348. They also give assurances that their OKOs are genuine, not the Chinese copies which aren't worth having. 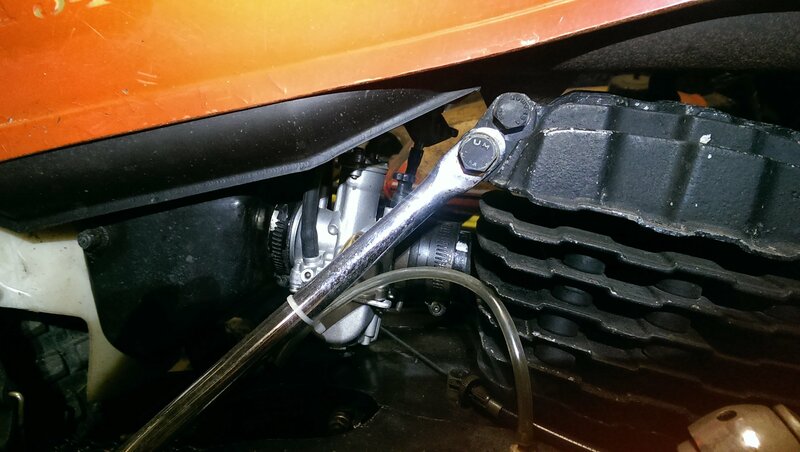 When I had the VM26 on it, I added a bush on the inlet bell to fit the standard Montesa connector to the airbox. With the OKO fitted it did not need a bush on the inlet bell, or stretching, to fit the standard airbox connector and it fits the connector to the cylinder which was from In Motion. If you are asking that question I'm wondering if you have read the info about fitting one to a 348 on the Mid Atlantic Trials website? My jetting is whatever it came with from Mid Atlantic Trials. I didn't pull it apart and haven't needed to pull it apart. This is correct: getting 1st and 2nd only is the classic symptom of the pawls carrier being upside down. The slot is not quite central, but appears to be at first glance. +1 for the 26mm oko I put one on mine and it starts and runs very well... if you want it to turn better change the head stock bearings for modern roller type bearings it will transform the steering. Thanks guys, always helpful what an excellent site. Post an issue and you get a global response. I'm a little bemused by the selector issue in as much as i've taken the primary casing off and i've found that the line and dot correspond when in neutral. BUT, ive looked at other images of similar Montesa selectors and found some with a spring loaded wheel mechaism which is missing on mine. My frame number is 51M 3188 which i believe it indicates it to one of the early batches of production, is mine missing this part???????? 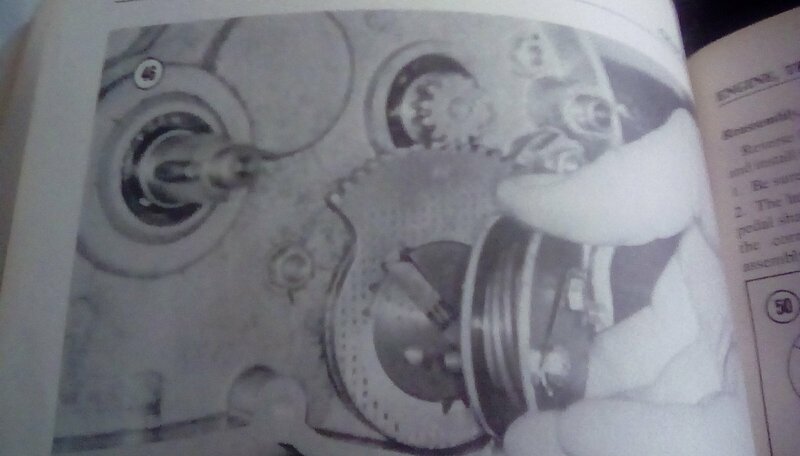 The first image is my bike the second is an image ive borrowed to ask the question, am i missing this spring loaded mechanism? If I am missing this id like to bring it to the attention of the gentleman i purchased it from asap. Hopefully this won't sound dismissive: changing the head bearings for roller type wouldn't change the head angle, so why would it transform the steering, unless it's simply the effect of replacing knackered bearings with decent ones of any type? Try undoing those flat-head screws to remove the shifter return spring assembly. Behind it you should see the spring-loaded pawls in their slot. That carrier needs to be removed and put back the other way up. Photo below shows the set-up on the Cota 247, which is similar. Just exposed the pawls, what do you think?